THE CROSS – I Am Not Ashamed Of The Gospel Of Christ! Blood is the very existance of LIFE! We are told in the old testament the importance of the shedding of blood made a Covenant between God and Man…….And would later learn the power of the shedding of the “Blood Of Christ” would bring Eternal Life to many. First Covenant brought through Moses A Man Of God. “And he took the book of the Covenant,and read in the audience of the people:and they said,All that the Lord hath said will we do,and be obedient. And Moses took the blood,and sprinkled it on the people,and said,Behold the blood of the Covenant which the Lord hath made with you concerning all these words. (Exodus 24:7-8). Jesus is the ultimate sacrifice God gave to us and it ensures Eternity with Him to all who repent and accept this Gift! “This is the Covenant that I will make with them after those days,saith the Lord,I will put my laws into their hearts,and in their minds will I write them;And their sins and iniquities will I remember no more.Now where remission of these is,there is no more offering for sin.Having therefore ,brethren,boldness to enter into the holiest By The Blood Of Jesus,By a new and living way,which he hath consecrated for us,through the veil,that is to say,his flesh;And having a high priest over the house of God”. (Hebrews 10:16-21). The Old Covenant is then done away through the shedding of the Blood Of Jesus! So “Let us draw near with a true heart in full assurance of Faith,having our hearts sprinkled from an evil conscience,and our bodies washed with pure water.Let us hold fast the profession of our Faith without wavering;(for he is Faithful that promised). (Hebrews 10:22-23). Christ has through the sacrifice of himself,become our “High Priest” who is seated at the right hand of God the Father. “Wherefore he is able also to save them to the uttermost that come unto God by him,seeing he ever liveth to make intercession for them.For such a High Priest became us,who is holy,harmless,undefiled,seperate from sinners,and made higher than the Heavens;Who needeth not daily,as those high priests,to offer up sacrifice,first for his own sins,and then for the people’s:For this he did once,WHEN HE OFFERED UP HIMSELF”. (Hebrews 7:25-27). 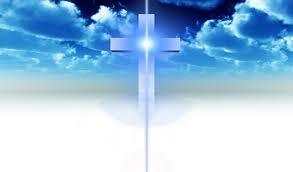 AND THIS IS THE RECORD,THAT GOD HATH GIVEN TO US ETERNAL LIFE,AND THIS LIFE IS IN HIS SON!!!! Rg Maffeo…..just hit the follow button and resubscribe. Don’t unsubscribe me . Hit wrong button.